More friends and a blog: A beautiful day in the neighbourhood. A beautiful day in the neighbourhood. What a delightful surprise it is to find unexpected flowers hiding in your garden, we almost missed this one, I found it tucked against the fence, almost hidden by another shrub. 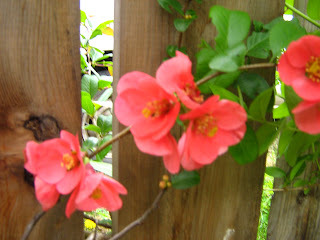 It is one that I brought a piece of from my folks' place when they sold it, actually the shrub that the flower was hiding behind is also from there, it is nice to have some of the flowers around that I remember from my childhood. Um , and here is another one brought from there. 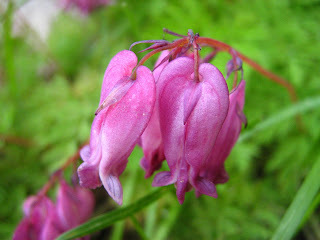 O.K and these bleeding hearts are also from there. (Yikes, you would think that I had taken all my Mom's plants.) I used to sell these, forget-me-nots, buttercups and ferns in lovely little bouquets when I was little. I did sell Kool-aid as well and sometimes I even sold rhubarb. I loved having a little stand and selling all these things. My mom used to tell me a story of how the bleeding heart got its name, am I the only one who was told this story? No one else I've met knows it. 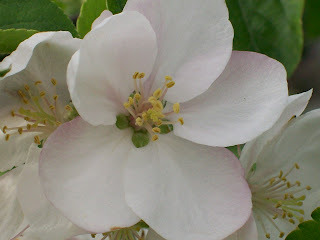 I was working on the apple trees today too and I love apple blossoms. 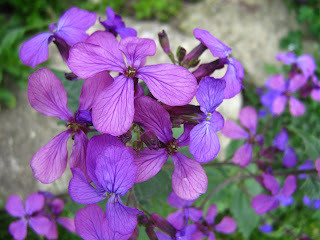 This afternoon was all about gardening, and boy, did we find some pretty stuff. E got ahold of the camera for awhile and is quite pleased with his pics. Here are three that he took. Then it was my turn again. 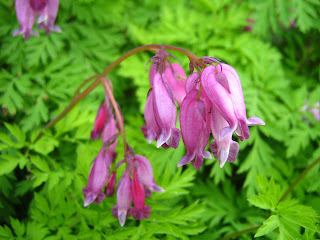 These are some other bleeding hearts,much larger than the purple ones above. When we first moved here we had a few white ones and a lot of pink ones, now they are all white. I'm not sure why this happened but I like little garden mysteries so now I just enjoy the white ones. 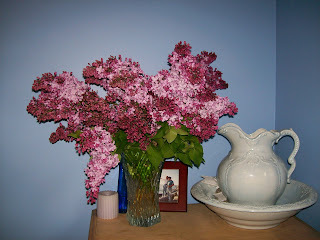 And these lilacs are from my neighbour. She knows that I love the smell but never want to cut mine as my lilac bushes are still fairly small, so she always brings us some. She also brought me some strawberry rhubarb and, after I borrowed some sugar from another neighbour to make rhubarb cake, we also had a delicious dessert tonight. And of course we shared some cake with both of our generous neighbours...so you see, it really was a beautiful day in the neighbourhood, in more ways than one. 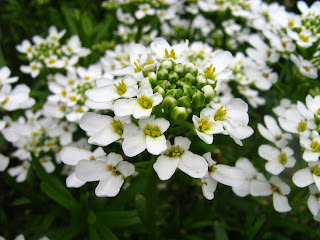 I was told the bleeding heart story too, Heather, but why can't I remember it? I sort of make it up, but would love to hear the original version... care to share? 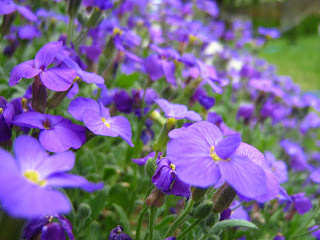 Your photos make me want to get my camera out and give it a whirl in my own backyard! BEAUTIFUL! 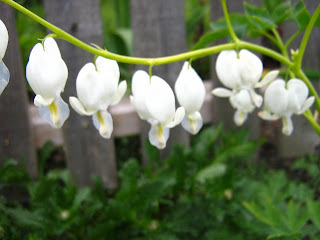 I heard the bleeding heart story once from an elderly neighbour when I was a little girl. The story is lingering just on the edges of my recollection. That neighbour had the most beautiful flowers and she was wheelchair bound due to Polio. 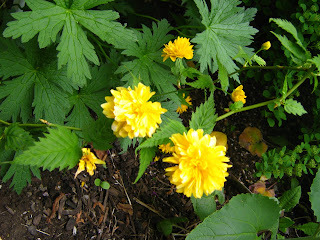 Somehow, she tended her plants (with help no doubt from her dear hubby) with loving care. I always remember her when I see bleeding hearts or lady slippers.